The Paiter Suruí people of the Amazon announced today that cosmetics giant Natura Cosméticos has purchased 120,000 tons of carbon offsets that the Suruí developed by saving endangered rainforest. It’s the first sale of forest-carbon credits developed by indigenous people, and one that provides a template for indigenous people across the Amazon. 10 September 2013 | Brazilian cosmetics giant Natura Cosméticos has purchased 120,000 tons of carbon offsets from the Paiter-Suruí­, an indigenous people of the Amazon who in June became the first indigenous people to generate credits by saving endangered rainforest using the Verified Carbon Standard’s (VCS) for “REDD” (Reduced greenhouse gas Emissions from Deforestation and forest Degradation). The transaction is also the first of its kind, and is being watched by indigenous people across the Amazon as well as by companies looking to meet their Corporate Social Responsibility (CSR) requirements. Natura is Latin America’s largest cosmetics maker and has committed to reduce its greenhouse gas emissions by one-third from 2006 levels by the end of 2013. A cornerstone of this effort is the Natura Carbon Neutral initiative, a public commitment to offset those emissions that cannot be reduced internally by investing in emission-reduction projects from other institutions whose values and beliefs are aligned with their own. “Since we made a commitment to be a carbon neutral company in 2007, Natura offsets 100% of its emissions,” says Denise Alves, Director of Sustainability. 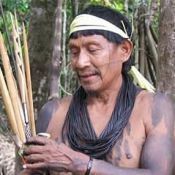 The Suruí­ will use the proceeds to jumpstart their 50-year “Life Plan”, which is designed to create a sustainable economy that blends traditional land-use practices, ecotourism, and the harvesting of non-timber forest products with modern scientific methods and procedures. Until 1969, the Surui were an isolated people living in harmony with the forest. After losing much of their territory to illegal logging, they have become leading proponents of rainforest preservation. The Surui Forest Carbon Project is designed to prevent at least five million tons of carbon dioxide from being emitted over 30 years while protecting critical rainforest habitat, and its credits have been certified under both the Verified Carbon Standard (VCS) and the Climate, Community, and Biodiversity (CCB) Alliance. The VCS employs a rigorous set of criteria to ensure that actions taken by project proponents actually did preserve the forest, and CCB provides further tests to ensure the project doesn’t harm people or habitat. The project generated its first credits in June, 2013, after an audit by Imaflora (Instituto de Manejo e Certificaçí£o Florestal e Agrí­cola/Institute for the Management and Certification of Forests and Farms) and the Rainforest Alliance confirmed that protective actions taken by the Surui had been successful. It began in 2007, when Chief Almir Surui first approached the Washington, DC-based environmental nonprofit organization Forest Trends (publisher of Ecosystem Marketplace) for help in reforesting his people’s territory after decades of invasion by loggers. There, he learned of REDD. To lay the foundation of a carbon project being able to be developed, Forest Trends commissioned a precedent-setting legal review that concluded that not only the Surui but all indigenous peoples in Brazil with demarcated territories have carbon ownership rights. In 2009, the four clans and 25 villages of the Suruí­ voted to impose and enforce a logging moratorium and to work with Idesam (Instituto de Conservaçí£o e Desenvolvimento Sustentavel do Amazonas/Institute for the Conservation and Sustainable Development of Amazonas) to ensure that the impacts of the Suruí­ actions were measurable, reportable, and verifiable. In 2010, Funbio (Fundo Brasileiro da Biodiversidade/Brazilian Biodiversity Fund) joined the partnership to create the Suruí­ Trust Fund and ensure that income from the project is managed responsibly and transparently. Local authorities, including Funai (Fundaçí£o Nacional do índio/National Indian Foundation), have since endorsed the Suruí­ effort as a model project and are supportive of their deal with Natura. In addition to Forest Trends, Chief Almir credits several partner organizations with bringing the project to fruition. Brazilian nonprofit organization Idesam provided technical support to determine which portions of the 248,147-hectare territory were in danger and estimate the carbon content. Longstanding Suruí­ partners Kanindé (Associaçí£o de Defesa Etnoambiental Kanindé) and ECAM (Equipe de Conservaçí£o da Amazí´nia/Amazon Conservation Team Brazil) helped members of the Suruí­ understand the project in accordance with the principles of Free, Prior, and Informed Consent (FPIC) as articulated in Convention 169 of the International Labor Organization (ILO). ← Key Companies Have Stepped Up on Climate Change. Will Governments Leave Them in The Lurch?